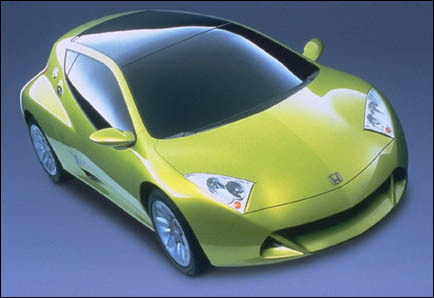 The J-VX, which was presented as a concept car at the Tokyo Motor Show in October, 1997, is an expression of sportiness and driving pleasure combined with environmentally friendly technology. These qualities are the the result of lightweight construction techniques and Honda's new hybrid power-train concept. At the core of this hybrid system is a 1.0 liter 3-cylinder engine that employs Honda's newly developed direct fuel injection system and which is combined with an extremely compact electrical motor/generator. 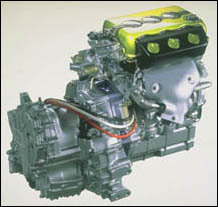 The Integrated Motor Assist (IMA) motor/generator is installed between the combustion engine and the transmission. The IMA motor supplies additional power during the acceleration by converting electrical power into kinetic energy. During deceleration, the IMA motor reverses the process to turn kinetic energy back into electrical current. 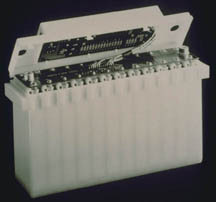 Instead of batteries, the J-VX employs an "ultra-capacitor" to store the electrical charge for the IMA system. Thanks to the IMA system, it is possible for the power-train of the J-VX to match the performance of a conventional 1.5-liter engine. However, the IMA system greatly reduces fuel consumption and emissions compared with a conventional engine providing similar performance. The J-VX, with its direct-injection 1.0 liter engine requires an average of only 3.5 liters of gasoline per 100 kilometers traveled. The hybrid power-train drives the front wheels through an efficient continuously-variable transmission (CVT), which also was developed by Honda. The J-VX is 3840 mm (152 in.) long, 1750 mm (69 in.) wide, and only 1255 mm (49 in.) high. The wheelbase of this compact sports car is 2360 mm (93 in.). The other features of the J-VX include ABS, high intensity discharge headlights, a glass sunroof, airbags, and a novel four-point "Air-Belt" restraint system. 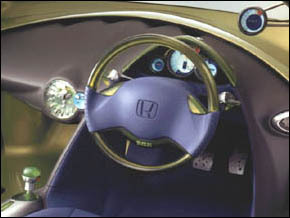 Honda's unique Air-Belt system, shown for the first time in the J-VX concept car, deserves special mention. In a frontal collision, this system inflates the shoulder and chest parts of the safety belts to softly restrain and protect the passengers from injuries that could result from a conventional safety belt. 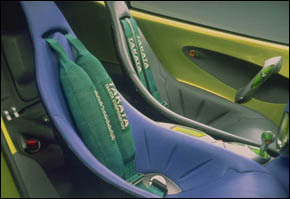 The Air-Belt system consists of an inflatable belt, an inflation unit, and a control unit, which activates the system in concert with the airbags. I gratefully acknowledge the source of these photos of and information about the J-VX and Air-Belt information is the 1999 German text, Honda Automobiltechnisches Lexikon 1948-1998, by Herbert Schmitt and Gerhard Grindl. This incredibly complete book is filled with pictures and descriptions of every Honda automobile ever produced by the Honda Motor Co.—including many cars that were unfortunately never sold in North America.